The discovery images of 2012 VP113, which has the most distant orbit known in our Solar System. Three images of the night sky, each taken about 2 hours apart, were combined into one. The first image was artificially colored red, second green and third blue. 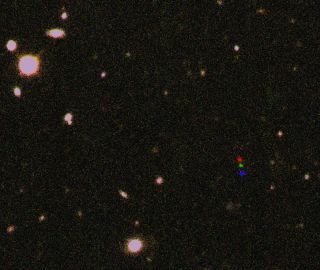 2012 VP113 moved between each image as seen by the red, green and blue dots. The background stars and galaxies did not move and thus their red, green and blue images combine to show up as white sources. Astronomers have found a new dwarf planet far beyond Pluto's orbit, suggesting that this distant realm contains millions of undiscovered objects — including, perhaps, a world larger than Earth. The newfound celestial body, called 2012 VP113, joins the dwarf planet Sedna as a confirmed resident of a far-flung and largely unexplored region scientists call the "inner Oort Cloud." Further, 2012 VP113 and Sedna may have been pulled into their long, looping orbits by a big planet lurking unseen in these frigid depths. For several decades, astronomers have divided our solar system into three main parts: an inner zone containing the rocky planets, such as Earth and Mars; a middle realm housing the gas giants Saturn, Jupiter, Uranus and Neptune; and an outer region called the Kuiper Belt, populated by distant and icy worlds like Pluto. These images show the discovery of the new inner Oort cloud object 2012 VP113 taken about 2 hours apart on UT November 5, 2012. The motion of 2012 VP113 clearly stands out compared to the steady state background stars and galaxies. And now astronomers know Sedna is not alone out there. Trujillo and Scott Sheppard, of the Carnegie Institution for Science in Washington, D.C., discovered 2012 VP113 using the Dark Energy Camera, which is installed on a 4-meter telescope at the Cerro Tololo Inter-American Observatory in Chile. Follow-up observations by the 6.5-meter Magellan Telescopes at Las Campanas Observatory, also in Chile, helped Trujillo and Sheppard determine details of 2012 VP113's orbit and learn a bit more about the object. The study was published online today (March 26) in the journal Nature. Orbit diagram for the outer solar system. The sun and terrestrial planets are at the center. The orbits of the four giant planet Jupiter, Saturn, Uranus and Neptune are shown by purple solid circles. The Kuiper Belt (including Pluto) is shown by the dotted light blue region just beyond the giant planets. Sedna's orbit is shown in orange while 2012 VP113's orbit is shown in red. Both objects are currently near their closest approach to the sun. They would be too faint to detect when in the outer parts of their orbits. Astronomers don't know much about the origin or evolutionary history of Sedna and 2012 VP113 at this point. The objects may have formed closer to the sun, for example, before getting pushed out by gravitational interactions with other stars — perhaps "sister stars" from the sun's birth cluster, researchers said. Or inner Oort Cloud objects may be alien bodies that the sun plucked from another solar system during a stellar close encounter. It's also possible that 2012 VP113 and its neighbors were knocked from the Kuiper Belt to the inner Oort Cloud when a big planet was booted outward long ago. This planet may have been ejected from the solar system entirely, or it may still be there in the extreme outer reaches, waiting to be discovered. Such supposition is far from proof that an undiscovered "Planet X" actually exists, Trujillo stressed. But he did say that the door is open, noting that an Earth-mass body at 250 AU from the sun would likely be undetectable at present. "It raises the possibility that there could be stuff out there of significant mass, Earth-mass or larger, that we don't know about," he said. The picture should clear up as more inner Oort Cloud objects are found, allowing astronomers to put more constraints on the origin and orbital evolution of these frigid, distant bodies. "I think it's a little hard to draw firm conclusions from two objects," Trujillo said. "If we were to have 10 inner Oort Cloud objects, then we could really start saying detailed things about the formation scenarios."